Perform I/O to any asyn device that supports the asynOctet, asynInt32, asynUInt32Digital, and/or asynFloat64 interfaces. Allow EPICS to communicate with a new device without rebooting the IOC, i.e. without writing any C code or changing the database. This allows Channel Access clients to communicate with devices for which no EPICS device support exists. In combination with the scalcout record to format output strings and to parse response strings, eliminate the need for C device support code in many applications. Dynamically change the asyn device "port" and "address", so a single asyn record can be switched from talking to one device to another at run time. Dynamically change the asyn interface being used for I/O. Manage the connection state of a device, i.e. connect/disconnect, enable/disable, autoConnect/noAutoConnect.. Provide access to asynTrace, controlling debugging output for any asyn device. Control the the baud rate, parity, etc. for serial ports whose drivers support the asynOption interface. Control the GPIB address and execute global and addressed commands for GPIB devices. 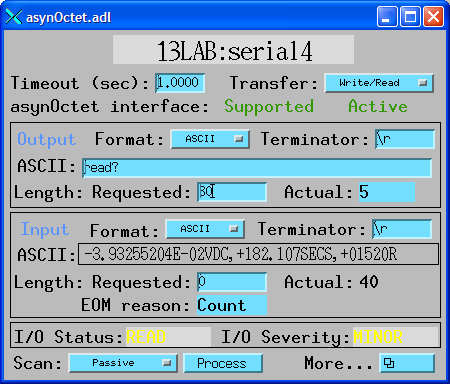 For the asynOctet interface there are two output fields, AOUT (ASCII Output) and BOUT (Byte Output). The OFMT (Output Format) field is used to select one of these fields or the other as the output source to the device. Similarly, there are two input fields, AINP (ASCII Input) and BINP (Byte Input). The IFMT (Input Format) field is used to select one or the other as the destination of data sent from the device. The ASCII fields are type DBF_STRING, and are very convenient for typical communication with many devices. They permit, for example, medm screens where the user can type a string and observe the response from the instrument. The ASCII fields, however are limited to 40 characters in length, and cannot be used to read or write binary data. The byte input and output fields are DBF_CHAR arrays, and can be used to transfer large blocks of arbitrary data, either ASCII or binary. R/W* Read and write are allowed; write triggers record processing if the record's SCAN field is set to "Passive". PORT R/W "asyn port" DBF_STRING The asyn "port" name. This field can be changed at any time to connect the record to another asyn device. ADDR R/W "asyn address" DBF_LONG The asyn address. This field can be changed at any time to connect the record to another asyn device. PCNCT R/W "Port Connect/Disconnect" DBF_MENU Disconnects or connects the port. Choices are "Disconnect" and "Connect". The value read reflects whether there is currently a valid connection to a port. DRVINFO R/W "Driver information" DBF_STRING A string that is passed to the driver with asynDrvUser->create(), assuming that the asynDrvUser interface exists. The driver will update pasynUser->reason and/or pasynUser->drvUser as a result. If pasynUser->reason is changed then the asynRecord REASON field will be updated. REASON R/W "Reason or command" DBF_LONG A integer "reason" or "command" that is typically used to tell the driver what item to read or write. This value is updated when connecting to the driver, using the DRVINFO field. It can be changed later without reconnecting to the driver. If REASON is changed then the DRVINFO field will be set to an empty string. The asyn record does not have traditional INP or OUT fields for input and output links. Rather it provides the PORT and ADDR fields to allow dynamically changing what asyn device the record is connected to. Writing to the PORT, ADDR or DRVINFO fields causes the asyn record to disconnect from the current device and connect to the specified asyn port and address. This permits a single asyn record to be used to control any asyn device. Writing to these fields does not cause any I/O to be done. Note that since writing to the PORT, ADDR, or DRVINFO fields cause the record to automatically attempt to connect to the port, it is usually not necessary to write to the PCNCT field to connect to the port. The PCNCT field is useful for determining if the port is connected, and for forcing a disconnect if desired. VAL R/W "Value field (unused)" DBF_STRING This field is unused. The functions normally assigned to the VAL field in many records are performed by the AOUT, BOUT, AINP, BINP, I32OUT, I32INP, UI32OUT, UI32INP, F64OUT, and F64INP fields in the asyn record. OCTETIV R "Octet Is Valid" DBF_LONG This field is (1,0) if the driver (does,does not) support the asynOctet interface. I32IV R "Int32 Is Valid" DBF_LONG This field is (1,0) if the driver (does,does not) support the asynInt32 interface. UI32IV R "UInt32Digital Is Valid" DBF_LONG This field is (1,0) if the driver (does,does not) support the asynUInt32Digital interface. F64IV R "Float64 Is Valid" DBF_LONG This field is (1,0) if the driver (does,does not) support the asynFloat64 interface. OPTIONIV R "Option Is Valid" DBF_LONG This field is (1,0) if the driver (does,does not) support the asynOption interface. GPIBIV R "GPIB Is Valid" DBF_LONG This field is (1,0) if the driver (does,does not) support the asynGPIB interface. The TMOD field controls what type of I/O is performed when the record processes. "Write/Read" (default) The output data is sent from the selected output field to the device. A response is then read back into the selected input field. The response must be received within the time specified by TMOT. For asynOctet the input buffer is flushed before the write operation, so that any characters received prior to the write operation are discarded. The Write/Read operation is "atomic", meaning that it is guaranteed that no other asyn I/O to the device will occur between the write and read operations. "Write" The output source is sent to the device. No response is read back. "Read" Data is read from the device into the input field. The response must be received within the time specified by TMOT. No output is sent to the device prior to the read operation. "Flush" The input buffer is flushed. Nothing is sent to the device or read from the device. Applies only to asynOctet. "NoI/O" The record processes but no I/O is actually performed. This mode can be used as a safety feature when using an asyn record to just control the trace fields of asyn ports. If the record is in this mode and is accidentally processed, then no I/O will occur. 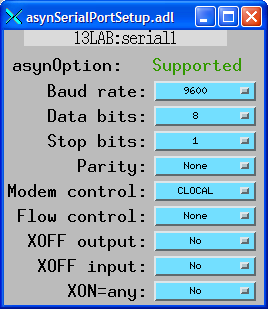 These fields control output I/O when using the asynOctet interface (i.e. when IFACE="asynOctet"). AOUT R/W* "Output string" DBF_STRING The output string which is sent to the device if OFMT="ASCII". The number of bytes sent to the device will be strlen(AOUT) plus strlen(OEOS). BOUT R/W* "Output byte data" DBF_CHAR (array) The output data which is sent to the device if OFMT="Binary" or "Hybrid". The maximum length of this field is controlled by OMAX. The actual number of bytes to be sent to the device when OFMT="Hybrid" will be strlen(BOUT) plus strlen(OEOS). The actual number of bytes to be sent to the device when OFMP="Binary" will be NOWT. OEOS R/W "Output terminator" DBF_STRING A character string that is appended to the output before transmission to the device. This field is ignored if OFMT="Binary". Set this field to "" to suppress transmission of a terminator. Commonly used values are "\r" (the default), "\n", and "\r\n". OMAX R "Max. size of output array" DBF_LONG The allocated length of the BOUT array. This value cannot be changed after IOC initialization. Default=80. NOWT R/W "Number of bytes to write" DBF_LONG The number of bytes to send from the BOUT array to the device if OFMT="Binary". This value must be less than or equal to OMAX. Default=80. NAWT R/W "Number of bytes actually written" DBF_LONG The actual number of bytes written in the last write operation. This field is valid for all OFMT modes. This number does not include the output terminator, if any. "ASCII "(default) The data sent to the device will be taken from the AOUT field. "Hybrid" The data sent to the device will be taken from the BOUT field. "Binary" The data sent to the device will be taken from the BOUT field. There are two output fields, AOUT (ASCII Output) and BOUT (Byte Output). The OFMT (Output Format) field is used to select one of these fields or the other as the output source to the device. If OFMT="ASCII" then the AOUT field is processed with dbTranslateEscape() to convert control characters (e.g. "\r", "\021") to bytes, the length of the output is determined with strlen(), and the string is sent to the device using asynOctet->write. This will append the output EOS if one has been set. If OFMT="Hybrid" then the BOUT field is processed with dbTranslateEscape() to convert control characters (e.g. "\r", "\021") to bytes, the length of the output is determined with strlen(), and the string is sent to the device using asynOctet->write. This will append the output EOS if one has been set. If OFMT="Binary" then NOWT bytes from the BOUT field are sent to the device using asynOctet->write. This will not append an output EOS. OEOS is set to the current value for the port when the record connects to the port. If OEOS is modified after the record connects to the port, then the output EOS will be changed using asynOctet->setOutputEos. IMPORTANT: The value of OEOS in the database file is never used, because it is modified when the record connects to the port. These fields control input I/O when using the asynOctet interface (i.e. when IFACE="asynOctet"). AINP R "Input string" DBF_STRING The input string that is read from the device if IFMT="ASCII". The string will be null terminated. Note that due to the maximum size of a string in EPICS, the input string must be less than 40 characters. If longer strings are required then set IFMT="Hybrid" and read into the BINP field. BINP R "Input byte data" DBF_CHAR (array) The input data that is read from the device if IFMT="Hybrid" or IFMT="Binary". The maximum length of this field is controlled by IMAX. The actual number of bytes read from the device is given by NORD. IEOS R/W "Input terminator" DBF_STRING A string that indicates the end of a message on input. Set this field to """ if no input terminator should be used. This field is ignored if IFMT="Binary". Commonly used values are "\r" (the default), "\n", and "\r\n". The input terminator is removed from the input buffer after the read. IMAX R "Max. size of input array" DBF_LONG The allocated length of the BINP array. This value cannot be changed after IOC initialization. Default=80. NRRD R/W "Number of bytes to read" DBF_LONG The requested number of bytes to read. This field is valid for all IFMT modes. If this field is <= 0, then the requested number of bytes to read will be the EPICS defined MAX_STRING_SIZE=40 (if IFMT="ASCII") or IMAX (if IFMT="Hybrid" or "Binary"). Default=0. NORD R "Number of bytes read" DBF_LONG The actual number of bytes read in the last read operation. This field is valid for all IFMT modes. This number includes the input terminator, if any. "ASCII" (default) The data read from the device will be placed in the AINP field. "Hybrid" The data read from the device will be placed in the BINP field. "Binary" The data read from the device will be placed in the BINP field. There are two input fields, AINP (ASCII Input) and BINP (Byte Input). The IFMT (Input Format) field is used to select one or the other as the destination of data sent from the device. If IFMT="ASCII" then input is read into the AINP field with asynOctet->read. This will remove the input EOS string, if any, and AINP will be NULL terminated if possible. If IFMT="Hybrid" then the input is read into the BINP field with asynOctet->read. This will remove the input EOS string, if any, and BINP will be NULL terminated if possible. If IFMT="Binary" then the input is read into the BINP field using asynOctet->read. This will ignore the input EOS. BINP will be null terminated. The TINP field is intended for operator display. It will contain up to the first 40 characters of the input read into AINP (if IFMT="ASCII") or BINP (if IFMT="Hybrid" or "Binary"). Non-printable characters are first converted to a printable form using epicsStrSnPrintEscaped. This field should not normally be using for parsing the response from the device. 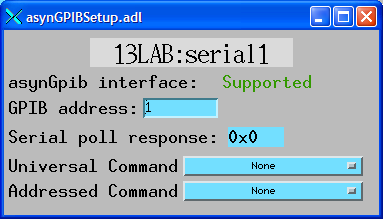 This is the field that is shown as the ASCII input field in the medm display asynRecord.adl. It is useful for displaying the device response, even in "Hybrid" and "Binary" input modes. The IEOS terminator field is 40 characters long. However, the serial drivers permit 2 character end-of-message strings at most. The GPIB drivers only permit 1 character end-of-message strings. IEOS is set to the current value for the port when the record connects to the port. If IEOS is modified after the record connects to the port, then the input EOS will be changed using asynOctet->setInputEos. IMPORTANT: The value of IEOS in the database file is never used, because it is modified when the record connects to the port. These fields control I/O when using the register interfaces (i.e. when IFACE="asynInt32", "asynUInt32Digital", or "asynFloat64"). I32INP R "asynInt32 input" DBF_LONG The input data that is read from the device if IFACE="asynInt32" and TMOD="Read" or "Write/Read". I32OUT R/W* "asynInt32 output" DBF_LONG The data that is sent to the device if IFACE="asynInt32" and TMOD="Write" or "Write/Read". UI32INP R "asynUInt32Digital input" DBF_ULONG The input data that is read from the device if IFACE="asynUInt32Digital" and TMOD="Read" or "Write/Read". UI32OUT R/W* "asynUInt32Digital output" DBF_ULONG The data that is sent to the device if IFACE="asynUInt32Digital" and TMOD="Write" or "Write/Read". UI32MASK R/W "asynUInt32Digital mask" DBF_ULONG The mask that is used if IFACE="asynUInt32Digital". The mask is used for both write and read operations. Only bits that are set in mask will be modified on writes, and any bits that are clear in mask will be zero on read. F64INP R "asynFloat64 input" DBF_DOUBLE The input data that is read from the device if IFACE="asynFloat64" and TMOD="Read" or "Write/Read". F64OUT R/W* "asynFloat64 output" DBF_DOUBLE The data that is sent to the device if IFACE="asynFloat64" and TMOD="Write" or "Write/Read". BAUD R/W "Baud rate" DBF_MENU The baud rate for the port. Choices are "Unknown", "300", "600", "1200", "2400", "4800", "9600", "19200", "38400", "57600", "115200", "230400", 460800, 576000, 921600, and 1152000. Default="Unknown". Note that BAUD field is limited to 16 choices because it is of type DBF_MENU. The LBAUD field can be used to select baud rates that are not available in the BAUD menu. LBAUD R/W "Baud rate (long)" DBF_LONG The baud rate for the port as an integer. This field allows selecting any baud rate, including those not available in the BAUD menu field. Changing the BAUD field will change the LBAUD field accordingly. Changing the LBAUD field will change the BAUD field to the appropriate menu choice if possible, or to "Unknown" if that baud rate is not in the menu. PRTY R/W "Parity" DBF_MENU The device parity. Choices are "Unknown", "None", "Even", and "Odd". Default="Unknown". DBIT R/W "Data bits" DBF_MENU The number of data bits. Choices are "Unknown", "5", "6", "7", and "8". Default="Unknown". SBIT R/W "Stop bits" DBF_MENU The number of stop bits. Choices are "Unknown", "1" and "2". Default="Unknown". MCTL R/W "Modem Control" DBF_MENU Modem control. Choices are "Unknown", "CLOCAL" and "YES". Default="Unknown". IXON R/W "Output XOFF/XON" DBF_MENU XOFF/XON control on output. Choices are "Unknown", "No" and "Yes". Default="Unknown". If the IOC receives an XOFF character, it suspends output until an XON character is received. IXOFF R/W "Input XOFF/XON" DBF_MENU XOFF/XON control on input. Choices are "Unknown", "No" and "Yes". Default="Unknown". The IOC sends XOFF and XON characters as necessary to prevent input from coming in faster than programs are reading it. The external device sending the input data must respond to an XOFF character by suspending transmission, and to an XON character by resuming transmission. IXANY R/W "XON=any character" DBF_MENU Choices are "Unknown", "No" and "Yes". Default="Unknown". Allows any input character to restart output when output has been suspended with the XOFF character. Otherwise, only the XON character restarts output. This flag is not available on all systems, including WIN32. 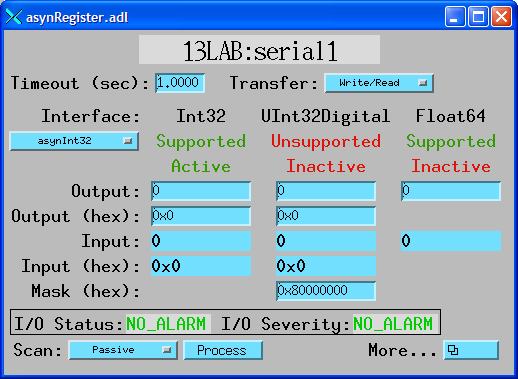 The above fields are used to set the serial port parameters. A write to any of these fields causes the port parameters to be changed immediately, but does not cause any I/O to be performed. The port parameters can currently be set only for local serial ports, including IP-Octal on vxWorks. They cannot currently be set for Ethernet/serial adapters like the Moxa units. The "Unknown" choice for each option is used on readback if the driver does not support that option. "Unknown" should not be written into the field. The baud rates actually available are device dependent. For the SBS IP-Octal module the maximum baud rate is 38400. These record fields are set to the values currently in effect for the port when the connection to the port is made. IMPORTANT: The value of these fields in the database file is never used, because it is modified when the record connects to the port. vxWorks and MCTL,FCTL. The sioLib serial support for vxWorks uses CLOCAL for what POSIX calls CTSRTS (Clear to send and request to send). It does not appear that sioLib has any concept of modem control, which is what POSIX calls CLOCAL. For vxWorks the standard serial support for asynDriver supplied in drvAsynSerialPort.c, accepts both MCTL and FCTL. MCTL=(CLOCAL,YES) is the same as FCTL=(None,Hardware). DRTO R/W "Disconnect on Read Timeout" DBF_MENU Choices are "Unknown", "No" and "Yes". Default="No". If Yes then the IP port will be disconnected on a read timeout. HOSTINFO R/W "IP port hostInfo" DBF_STRING The IP port hostInfo string with the same syntax as the drvAsynIPPortConfigure command i.e. host:port[:localport] [protocol]. Writing to the HOSTINFO field will cause the drvAsynIPPort driver to disconnect from the current host (if any) and then attempt to connect to the new host. If the drvAsynIPPort was created with the COM (RFC 2217) protocol then the serial control fields listed above can be used to control those settings on ther Ethernet/serial adapter. SPR R "Serial Poll Response" DBF_UCHAR The device status byte, which is read during a Serial Poll operation. GPIB Universal Commands are commands which are directed to all devices on the GPIB bus, not just addressed devices. If the UCMD field is set to any value except "None" then the appropriate Universal Command is executed, and UCMD is set back to "None". The record processing only performs the Universal Command, i.e. it does not also perform the GPIB operation indicated by TMOD. GPIB Addressed Commands are commands which are directed to only the addressed devices on the GPIB bus. If the ACMD field is set to any value except "None" then the appropriate Addressed Command is executed, and ACMD is set back to "None". The record processing only performs the Addressed Command, i.e. it does not also perform the GPIB operation indicated by TMOD. TMSK R/W "Trace mask" DBF_LONG The asynTraceMask. TB0 R/W "Trace error" DBF_MENU The ASYN_TRACE_ERROR bit. Choices are "Off" and "On". TB1 R/W "Trace IO device" DBF_MENU The ASYN_TRACEIO_DEVICE bit. Choices are "Off" and "On". TB2 R/W "Trace IO filter" DBF_MENU The ASYN_TRACEIO_FILTER bit. Choices are "Off" and "On". TB3 R/W "Trace IO driver" DBF_MENU The ASYN_TRACEIO_DRIVER bit. Choices are "Off" and "On". TB4 R/W "Trace flow" DBF_MENU The ASYN_TRACE_FLOW bit. Choices are "Off" and "On". TB5 R/W "Trace warning" DBF_MENU The ASYN_TRACE_WARNING bit. Choices are "Off" and "On". 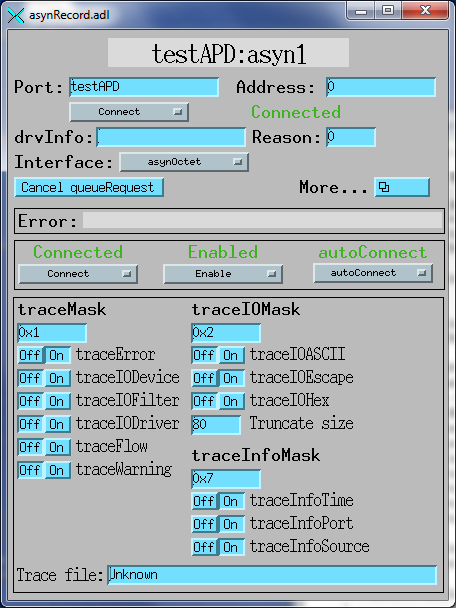 TIOM R/W "Trace I/O mask" DBF_LONG The asynTraceIOMask. TIB0 R/W "Trace IO ASCII" DBF_MENU The ASYN_TRACEIO_ASCII bit. Choices are "Off" and "On". TIB1 R/W "Trace IO escape" DBF_MENU The ASYN_TRACEIO_ESCAPE bit. Choices are "Off" and "On". TIB2 R/W "Trace IO hex" DBF_MENU The ASYN_TRACEIO_HEX bit. Choices are "Off" and "On". TINM R/W "Trace Info mask" DBF_LONG The asynTraceInfoMask. TINB0 R/W "Trace Info Time" DBF_MENU The ASYN_TRACEINFO_TIME bit. Choices are "Off" and "On". TINB1 R/W "Trace Info Port" DBF_MENU The ASYN_TRACEINFO_PORT bit. Choices are "Off" and "On". TINB2 R/W "Trace Info Source" DBF_MENU The ASYN_TRACEINFO_SOURCE bit. Choices are "Off" and "On". TINB3 R/W "Trace Info Thread" DBF_MENU The ASYN_TRACEINFO_THREAD bit. Choices are "Off" and "On". TSIZ R/W "TraceIO truncate size" DBF_LONG The parameter passed to asynTraceSetTraceIOTruncateSize(). This value is used to limit the number of I/O bytes printed by traceIO. TFIL R/W "Trace IO file" DBF_STRING The name of the file to which trace information is printed. The above fields are used to control the asynTrace facility. They allow one to turn on and off debugging output printed at the shell or written to the trace file. The TMSK field allows one to read/write the entire asynTraceMask word. The TB0-TB5 fields allow one to read/write the individual bits in asynTraceMask. The TIOM field allows one to read/write the entire asynTraceIOMask word, and the TIB0-TIB2 fields allow one to read/write the individual bits in asynTraceIOMask. The TINM field allows one to read/write the entire asynTraceInfoMask word, and the TINB0-TINB3 fields allow one to read/write the individual bits in asynTraceInfoMask. When the asyn record is connected to a new device with the PORT and ADDR fields the above trace fields are automatically updated to reflect the current asynTrace, asynTraceIO, and asynTraceInfo masks for that device. <stdout> - Write to standard out. <stderr> - Write to standard error. <errlog> - Use the errlog facility. AUCT R/W "Autoconnect" DBF_MENU Sets the autoconnect option. Choices are "noAutoConnect" and "autoConnect". The value read reflects current state of the autoconnect flag, i.e. the value returned from isAutoConnect(). ENBL R/W "Disable/Enable" DBF_MENU Disables or enables the port. Choices are "Disable" and "Enable". The value read reflects current state of the enabled flag, i.e. the value returned from isEnabled(). CNCT R/W "Connect/Disconnect" DBF_MENU Disconnects or connects the device. Choices are "Disconnect" and "Connect". The value read reflects current state of the connected flag, i.e. the value returned from isConnected(). ERRS R "Error status" DBF_STRING Error status string for the most recent operation. This string is set to "" (null string) at the start of each connection and I/O operation. AQR W "About queueRequest" DBF_CHAR Abort queueRequest. If a process request has been queued but not delivered it is canceled, the record is put into alarm and record completion occurs. The ERRS field is set to "" (null string) at the start of every operation, including trace and connection management operations. It contains the first 100 characters of any error message the record writes with asynPrint(...ASYN_TRACE_ERROR...). The standard EPICS record fields STAT (status) and SEVR (severity) are used to report the I/O error status. For example status field may be set to NO_ALARM, WRITE, READ, or COMM, and the SEVR field may be set to NO_ALARM, MINOR, or MAJOR. These alarm fields are only used to report I/O errors or errors when connecting to a new PORT or ADDR. They are not affected by trace or connection management operations. IPTR N "Input buffer pointer" DBF_NOACCESS The pointer to the buffer for the BINP field. OPTR N "Output buffer pointer" DBF_NOACCESS The pointer to the buffer for the BOUT field. The asyn record processes, i.e. performs the I/O operation given by TMOD, according to the normal rules for EPICS records. The AOUT, BOUT, I32OUT, UI32OUT, and F64OUT fields are Process Passive, so the record will process if these fields are written to and the SCAN field of the record is Passive. The scan field of the record can be set to any of the periodic scan rates (e.g. "1 second") for periodic processing, to "Event" for event processing, or to "I/O Intr" for I/O interrupt processing. "I/O Intr" scanning is fully supported for drivers that provide callbacks. If the SCAN field is "I/O Intr" it will be changed to "Passive" when any of the following fields are modified: PORT, ADDR, DRVINFO, REASON, IFACE, or UINT32MASK. This is necessary because changes to these fields require re-registering with the interrupt source. The asyn record is designed to be a complete replacement for the older generic serial ("serial") and generic GPIB ("gpib") records. These records are no longer needed, and will not be supported in the future. The following is a list of the differences between the old serial and GPIB records and the new asyn record which may require changes to databases or applications. The ODEL field has been replaced by OEOS. It has changed from a DBF_LONG to DBF_STRING in order to support multi-character terminators. The IDEL (serial) and EOS (gpib) fields have been replaced by IEOS. They have changed from a DBF_LONG to DBF_STRING in order to support multi-character terminators. The INP field has been replaced by the PORT and ADDR fields in order to support run-time connection to different devices. The AOUT and OEOS fields are processed by dbTranslateEscape before being sent to the device. In rare cases this may require changing the output strings if these contained the "\" character. The asyn record always posts monitors on the input field (AINP or BINP) when the record processes. The older records did not post monitors on the AINP field if the value was the same as the previous read. This caused problems for some SNL programs and data acquisition applications. The ODEL and IDEL fields were used even when OFMT or IFMT were in "Binary" mode. OEOS and IEOS are now ignored when OFMT or IFMT respectively are in "Binary" mode. The ODEL and IDEL fields were always used to set the input and output end of string. The IEOS and OEOS fields now are now initialized to the current EOS settings for the port when the record connects. IEOS and OEOS only change the EOS settings if these fields are modified after the record connects to the port. Thus, it is now important to initialize the EOS strings for the port correctly in the startup script. The TMOT field has changed from DBF_LONG to DBF_DOUBLE, and the units have changed from milliseconds to seconds. TMOT=-1.0 now means wait forever. The following are screen shots of the medm screens provided for the asyn record. The following is an IDL program that demonstrates the use of the asyn record. It transfers data in both ASCII and binary formats. Hopefully the IDL syntax is clear enough to be understood by non-IDL users, and can be translated into your favorite scripting language. ; This IDL program demonstrates the use of the EPICS asyn record. ; Record 1 sends a message to record 2 in ASCII. ; Record 2 sends a message back to record 1 in binary. The following is an IDL procedure that demonstrates the use of the asyn record to communicate with a Tektronix TDS200 Digital Oscilloscope. It transfers data in both ASCII and binary formats. It will work with either an RS-232 or GPIB connection to the scope. The record must be loaded with IMAX at least large enough to read the waveform. The entire waveform readout is 2500 channels on the TDS220. The buffer size required is 1 byte per channel + 7 bytes header/checksum. The start and stop parameters to the procedure can be used to read a subset of the waveform. Hopefully the IDL syntax is clear enough to be understood by non-IDL users, and can be translated into your favorite scripting language. ;     March 7,  2001 Correctly put record in Write and Write/Read modes. ;     Dec. 7,   2001 Set timeout to 2 seconds before read. ;     March 30, 2004 Change IFMT from Binary to Hybrid, other fixes. ; The first n_header bytes are header, the last byte is checksum.